A new twist on breakfast, if you will. 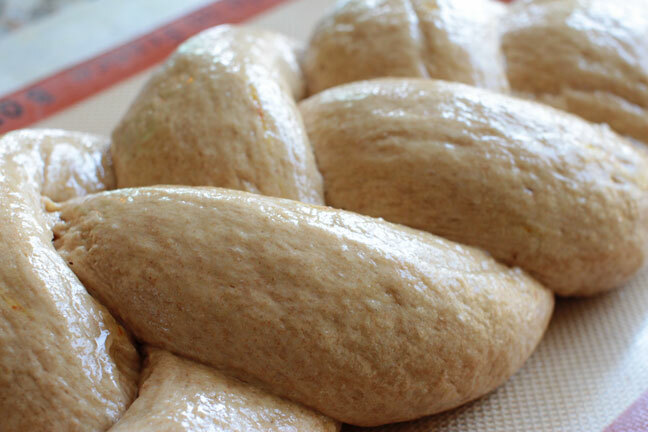 I’ve worked and re-worked this recipe to create a delicious vegan version of a traditional favorite bread, once again made possible by the magic of aquafaba (chickpea brine) in place of eggs. Check out my last recipe for Vegan Madeleines for a more detailed introduction to aquafaba if you haven’t heard of it yet. 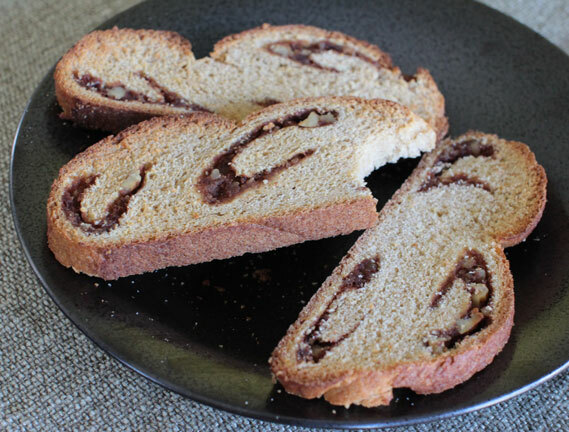 My whole wheat cinnamon walnut swirl challah is just a tad sweet, with dates and maple syrup as its only sweeteners, putting a burst of flavor in each bite. It really sings when toasted, and I’m sure it would make incredible french toast if you have some left over. 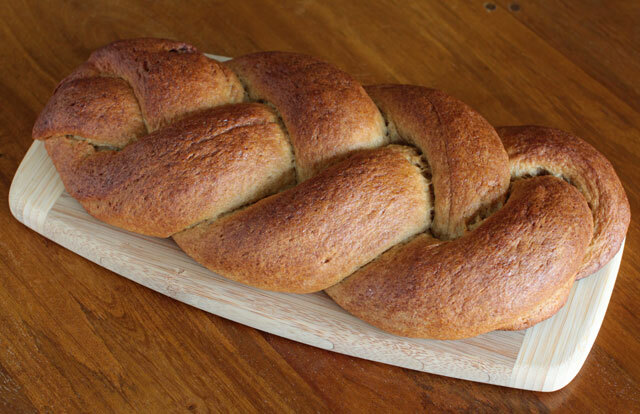 Bringing this braided loaf together might take some practice, as it did for me. As with anything, it’ll get easier and more beautiful with patience and persistence. The learning curve is steep and I’ll walk you through each step below, so if this looks like something you’d like to sink your teeth into, definitely give this recipe a try! If you’re feeling tentative, one idea is to simplify the recipe on your first attempt, and skip the cinnamon swirl to make this a basic whole wheat challah loaf, just to get a feel for how it all comes together. Or go for the gusto and dive right into the complete recipe… I don’t think you’ll regret it! I’ve been milling my own flour from soft white whole wheat berries using the dry blade container for my Vitamix blender. However, if you don’t have the equipment to do this yourself, you can pick up a bag of white whole wheat flour at most grocery stores with a decent health food section, or at Amazon or Vitacost. White whole wheat shares the nutritional value of regular whole wheat, but the kernels are softer, yielding a loaf of bread that’s lighter in color, milder in flavor and not as dense as bread made entirely of regular whole wheat. 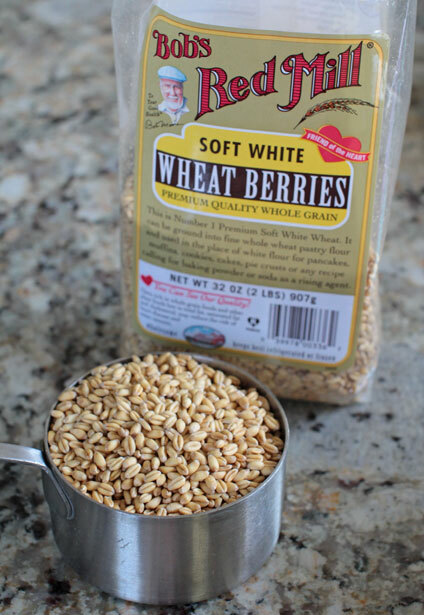 Sprouted whole wheat flour (also available at Amazon or Vitacost) contains regular whole wheat berries that were sprouted before being dried and milled into flour. The additional step of sprouting the wheat berries before grinding them, takes advantage of the plant’s natural processes to transform the kernels from a starch to a vegetable, so the nutrients are more digestible and accessible when eaten. The combination of three different flours helps to achieve an ideal balance of nutrition and lightness for this recipe, but you can play around with the proportions to suit your taste or the inventory of your pantry. Note: If you don’t have maple sugar (granulated maple syrup), you can use all maple syrup (3 Tbsp total). Just be sure that that dates are drained well so the filling won’t be too wet. In a small saucepan, warm ¾ cup plain, unsweetened almond milk (use this recipe if you’d like to make your own) over low heat just slightly, until it’s lukewarm to the touch. If it’s hot to the touch, it will kill the yeast. Stir in 1 Tbsp. maple syrup, then add the 2 heaping tsp. of active dry yeast and set aside until the mixture gets foamy and bubbly. In the meantime, in a large mixing bowl, sift together 1 cup sprouted wheat flour, 2 cups white whole wheat flour, 2 cups unbleached all-purpose flour, 1 tsp. sea salt and 1 tsp. baking powder. In a small soy sauce-sized bowl, put 1 Tbsp. of hot water and a pinch of saffron threads if you have them. 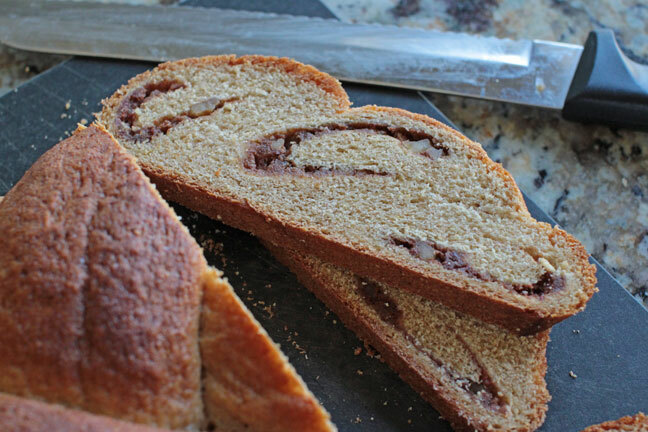 The saffron enhances the color and flavor of the bread, but this is an optional ingredient. 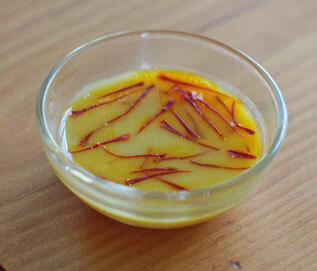 Set aside the saffron to allow the water to absorb it. You could also use a Tbsp. of warm almond milk for this step in place of the water. 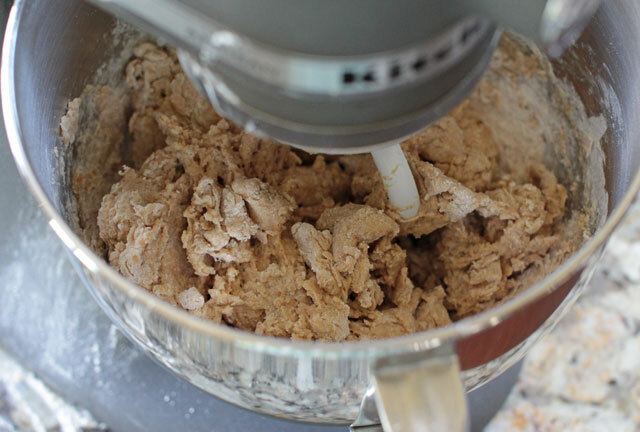 Run the stand mixer (or stir by hand) until the dough forms and becomes uniformly mixed. Then turn the dough out on a lightly floured surface or onto a silicone baking mat. Knead the dough by hand until it’s smooth and elastic, about ten minutes. Very lightly oil a large mixing bowl. 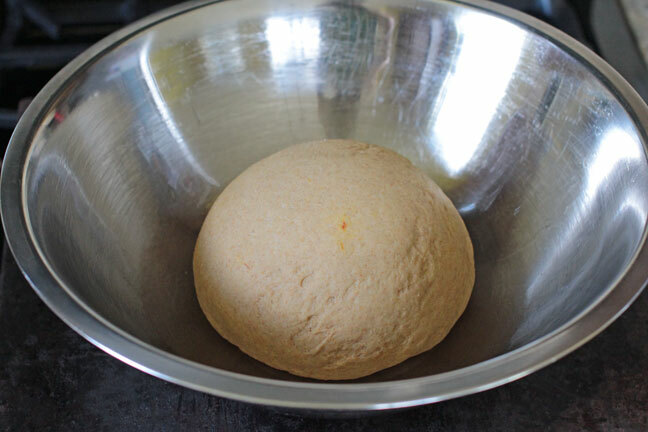 With wet hands, lightly moisten the kneaded dough ball and place it in the greased bowl. 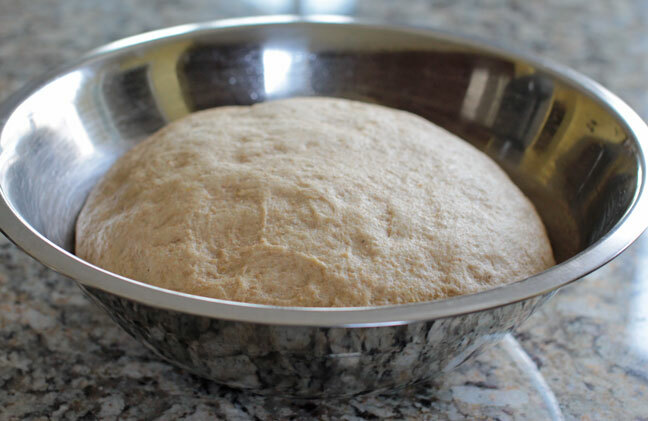 Cover the bowl with plastic wrap and allow the dough to rise in a warm place for at least an hour or up to two hours. I bring my oven to about 100°F, then shut it off and place the bowl inside the oven and turn on the oven light for a little continued warmth. While the dough is rising, make the filling. Remove the pits from 9 medjool dates, then place them in a small bowl and cover them with hot water, where they can stand until softened, anywhere from 15 minutes to an hour, depending on how hard they were to begin with. 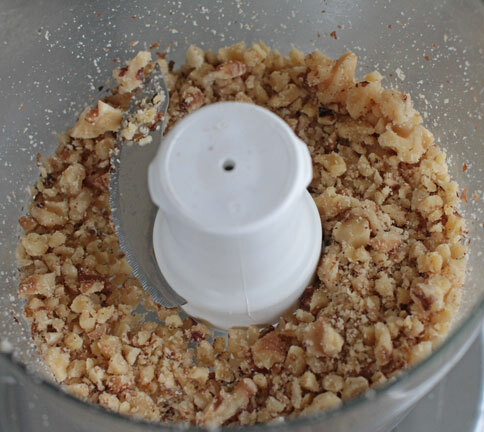 Using the small bowl of your food processor, pulse a half cup of walnuts to chop them into small chunks. Stop before they become flour, and set them aside in a small bowl. When the dates are soft, drain them very well by pressing out the extra water with your hands. Transfer the dates to the same small food processor bowl (remove the walnuts first, but no need to rinse or clean the bowl between steps). Add 2 tsp. ground cinnamon, and 2 Tbsp. maple sugar + 1 Tbsp. maple syrup (this combination is ideal because it’s drier, but if you don’t have maple sugar (granulated maple syrup crystals) then you can simply use 3 Tbsp. maple syrup instead). Puree the dates, maple and cinnamon until smooth. Wait for the dough to rise to twice its original size. 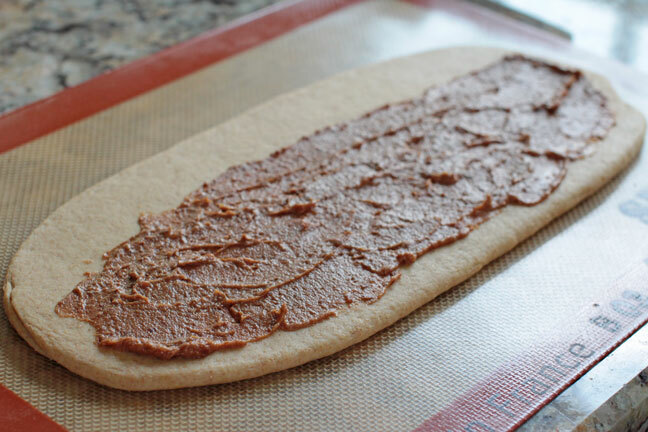 Punch down the dough, and roll it out onto your kneading surface. 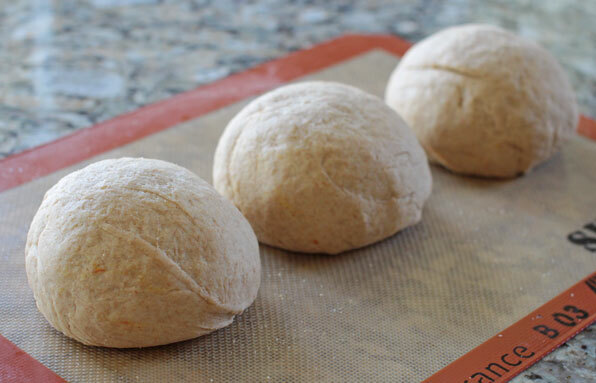 Form a ball, and then divide the dough into three smaller balls of equal weight. With wet hands, moisten each of the three dough balls, cover them with plastic wrap and allow them to rest for 15 minutes. 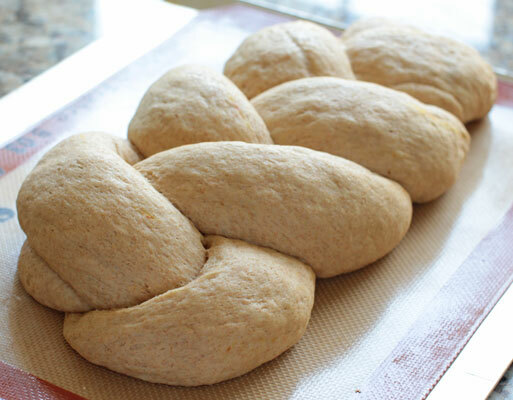 If you’re opting for plain whole wheat challah: You can roll each ball into a rope about 14 inches long and then skip to the braiding step. If you’re going for the whole cinnamon swirl shebang: Working with one dough ball at a time while the others are still covered with plastic wrap, begin by rolling one ball into a cylinder. 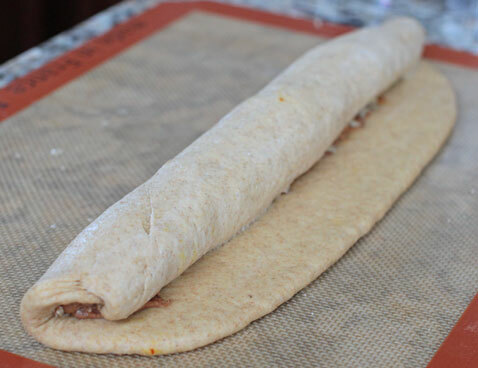 Then, use a rolling pin to roll it out into a oblong shape about a half-inch thick. 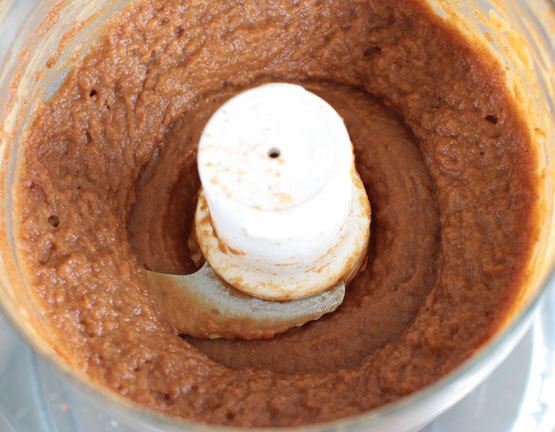 Spread a layer of date puree over the top surface, leaving a margin around all edges and a larger margin of about an inch and a half along the long edge further away from you. Then, sprinkle the date puree with a dusting of chopped walnuts. 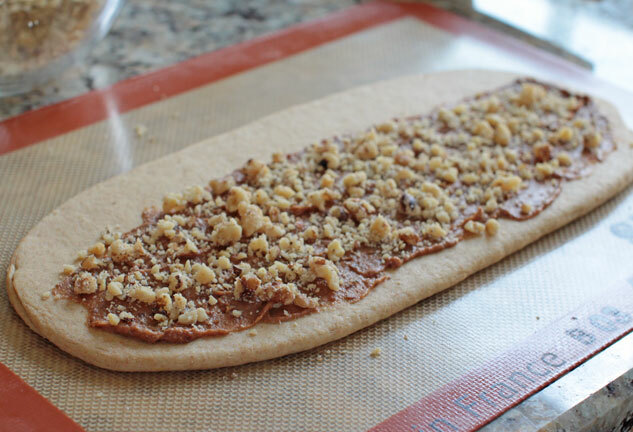 Cover the filling with a piece of parchment paper, and using the rolling pin, press the walnuts and date pure into the dough a little bit. Remove the paper. 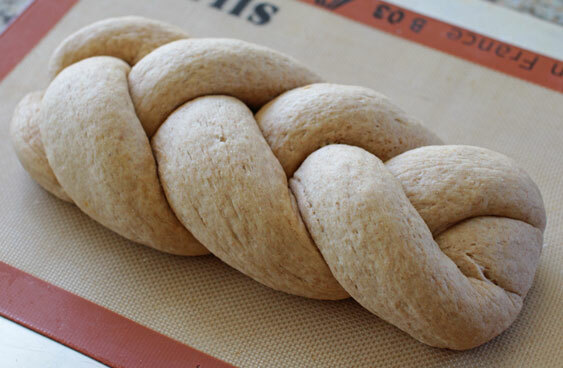 Wet your hands, and then begin rolling the dough into a rope, starting from the long edge closest to you and working toward that large margin you left at the other side. Pinch the open seam together with your fingers, as well as each end, then roll the rope a few more times in the same direction, to seal it shut. 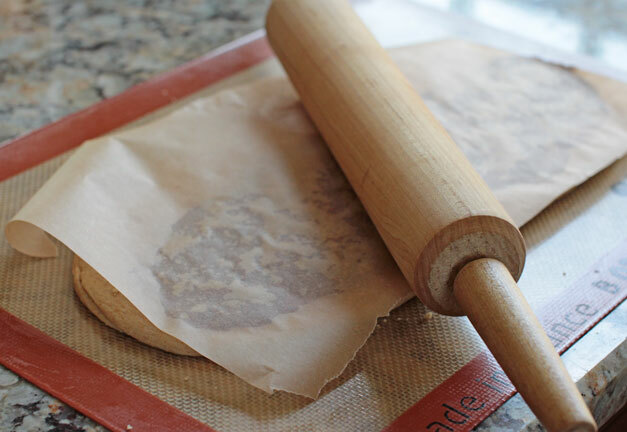 Set the rope on a greased baking sheet or piece of parchment, covered with plastic wrap, and repeat the rope making steps with the other two balls of dough. Moisten the ropes again with your wet hands, and allow them to rest for another 15 minutes, still covered with plastic wrap. Once your three ropes have rested, lie them side-by-side on a baking sheet that has either been lightly greased, or lined with your silicone baking mat or a piece of parchment paper. Pinch the ends together, and then begin braiding them like you would braid hair, by bringing the left rope over the middle one, and then the right rope over the new middle rope and continue from there. When you reach the end, once again pinch the ends together. Tuck both pinched ends under the braid. 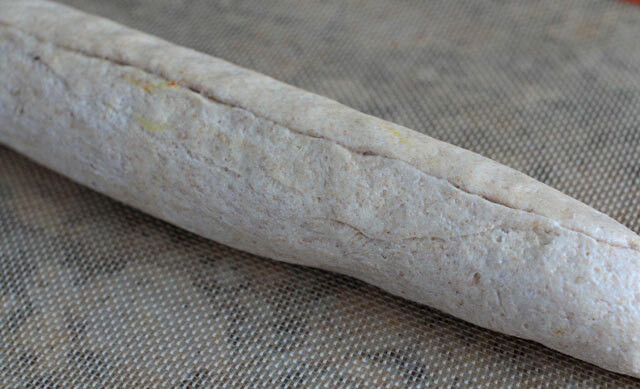 Moisten the loaf with wet fingers again, and cover with plastic wrap. Allow the loaf to rise again for at least a half hour, but preferably a full hour or more. 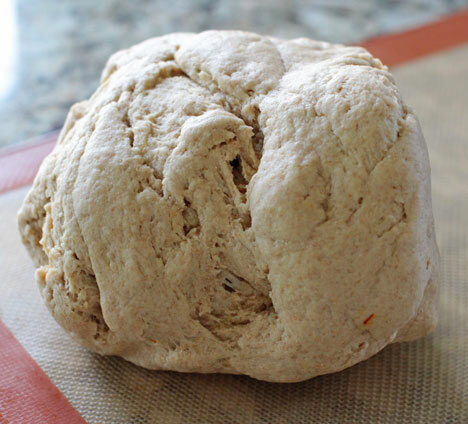 Don’t be alarmed if, upon rising, the dough tears a bit, like in the loaf shown below. 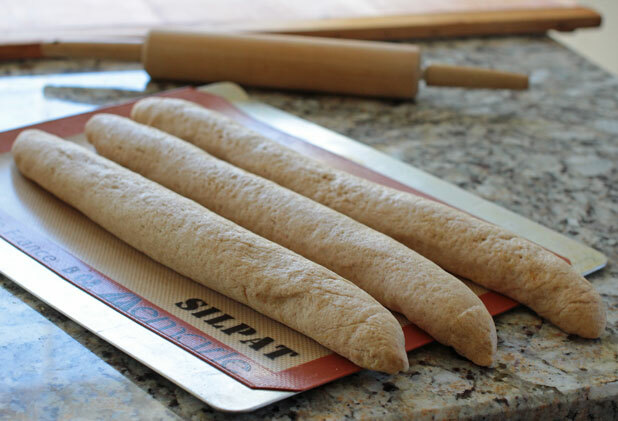 With practice, and with lots of vigorous kneading to help develop the gluten in the dough and make it stretchier, you can reduce or eliminate tearing. Toward the end of this last hour or so of rising, prepare your “egg” wash to give the bread its sweet, golden, shiny crust. Stir together 1 Tbsp. aquafaba, 1 Tbsp. grapeseed oil and 1 Tbsp. maple syrup. Whisk vigorously until emulsified (I use a fork for this). 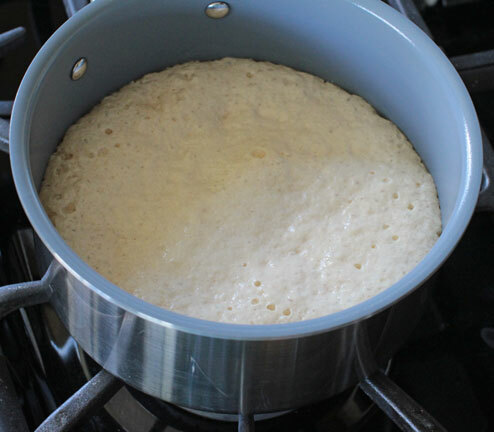 Once the dough has risen, preheat the oven to 375°F. Brush the wash over the entire loaf, applying several coatings until you’ve used up all of the wash. When the oven has come to temperature, slide the loaf in and bake for 40 minutes, until golden. When it’s done, the bread should sound hollow when tapped. Allow the loaf to cool to a touchable temperature, and then transfer it to a wire cooling rack to cool completely. Slice with a bread knife, toast and smear with your favorite vegan butter to serve. 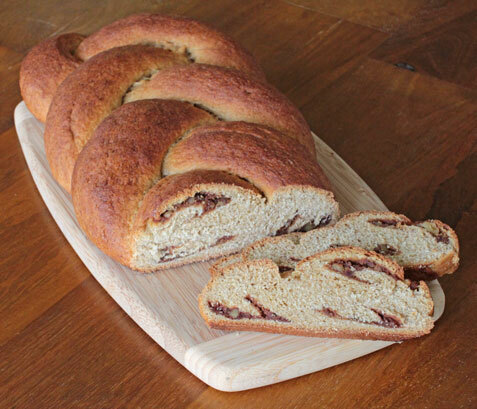 5 Responses to "Cinnamon Walnut Swirl Challah"
Thank-you so much for your recipes. I really enjoy your blog. I do have a question for you though. Have you figured out how much of the chickpea brine equals an egg. I have several recipes I would like to try, but am not sure of the measurement. Some call for 1 egg, some for two and yet others more. Thank-you for any help. Hi Suzie, thanks so much for visiting Green Sage and for your compliments. The current wisdom is that 3 Tablespoons of chickpea brine equals one egg. As you’re experimenting with substituting chickpea brine for eggs, keep in mind that this substitution will work better in recipes that call for a smaller proportion of eggs (2-3 eggs, like cakes, muffins, pancakes, etc.) than very egg-heavy recipes (4+ eggs, like quiche, souffle, pound cake, etc. ), because real eggs offer a unique set of qualities: binding the ingredients together, leavening (making it rise), and they add liquid and fat. Chickpea brine will not provide much leavening, so you’ll want to increase the quantity of baking powder and/or baking soda instead (and, when using baking powder, make sure there’s salt in your recipe, and when using baking soda, be sure there’s an acid, such as apple cider vinegar or lemon juice to activate its leavening properties). And chickpea brine does not contribute any fat, so you may also want to think about increasing the quantity of oil or other fat-containing ingredients to keep the recipe moist. Hope this is helpful!